It now takes one tree every year for every man, woman and child to meet their needs for paper, packaging, lumber, fiber compounds and panel products. Annually, every American uses a tree 16 inches in diameter by 100 feet tall. That's a lot of trees! Because industry recycles many paper and wood products today, you are consuming only one tree -- before the 1990's you used more. Americans now recover 45% of all paper used, and the nation's industry has set a goal to recycle half of all paper used in the year 2001. Your tree won't be harvested from our national parks, wilderness areas, or other special unique forests that have been set aside for their diversity, beauty or recreational value. About 11 million acres of Oregon forest land (41% of all forests) is reserved from commercial timber harvest in old growth reserves, wilderness, riparian corridors, parks and other withdrawals. Understanding the ecology and history of your tree allows foresters, biologists, hydrologists, loggers and other forest professionals to determine the best practices to use to regenerate and care for it and its surrounding forest environment. Forest professionals and scientists have learned a lot during the past century about how to best manage your tree. How your tree is harvested determines the species makeup and complex characteristics of the forest. Your tree may be harvested to open up the forest canopy to provide additional sunlight, moisture and nutrients to other trees, plants and animals. Many species require open forests or sunny ecosystems to thrive--others do not. Silviculturists and other scientists carefully evaluate forest objectives in determining how and when to harvest your tree. Improved logging engineering recovers more wood from your tree, and augments ecologically sensitive timber harvest. Innovation in the woods means you need only one tree this year -- before the 1990's, you used more. 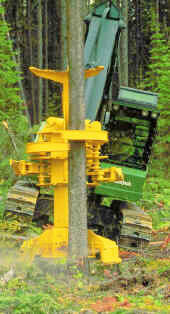 Logs once considered too small to harvest, are now affordably utilized through improving technology such as the: harvester-processor, radio carriage, computer mechanics, mobile skyline equipment, cut-to-length system, directional felling, mechanical delimber, feller-buncher, low ground-pressure skidder, and helicopter refinement. Today's Oregon professional logger understands that versatile techniques, high-tech equipment, and better engineering are the tools that will maintain healthy forest ecosystems and provide for society's wood needs. You needn't be concerned that by harvesting your tree the process ends there. 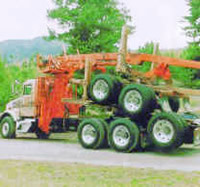 Successful reforestation is required after harvest in Oregon. 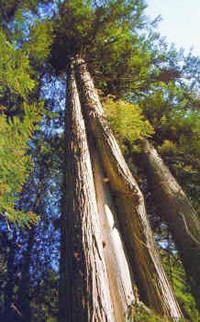 After your tree is logged, several young seedlings are planted within two years to replace it -- and forest rules assure that seedlings are watched and replanted if necessary. Oregon has the highest reforestation compliance rate in the nation -- averaging 97% of all acres requiring reforestation. 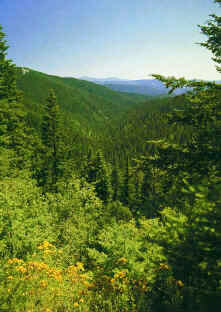 Landowners in Oregon planted trees to reforest a total of 150,879 acres in 1996. To replace your tree in 1996, more than 40 million seedlings were planted -- that's 12 seedlings for every Oregonian. If your tree is a Douglas fir, it will likely be harvested in a clearcut. Clearcutting provides needed open forest diversity essential to balanced ecosystems and the Douglas fir. A balanced ecosystem has a mosaic of both open and closed forests. 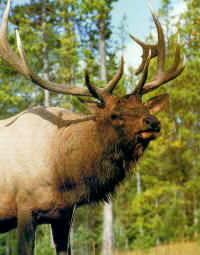 Openings offer valuable habitat for your Douglas fir tree and many wildlife species that prefer open environments -- such as the horned lark, long-tailed vole, deer and elk. In Oregon, 14% of the area harvested each year is done by clearcutting. Your tree could be harvested in a partial-cut, or what's called a "thinning." As forests grow older, your tree may become overcrowded, stressed and unhealthy. Several decades after planting, forests are periodically thinned to harvest some trees -- which allows more room for other trees, plants and animals to thrive. In Oregon, 86% of the area harvested each year is done by thinning. To ensure that all landowners, small or large, harvest your tree in an environmentally sound manner, the Legislature created the Oregon Forest Practices Act in 1971. For more than 30 years, the state's forest practices act and rules have been strengthened to lead the nation in assuring environmental protection during timber harvest and reforestation. Your tree most likely won't be cut next to a stream, because these "riparian" areas are too important to water quality and fish & wildlife needs. Many trees are left to grow to an old age along streams--or scattered across a clearcut--because older live, dead and fallen trees provide diversity needed by some forest species. The tree harvested to provide the products you use this year won't be a designated wildlife snag or downed log because those are left for wildlife habitat. Ecologists like Dr. Fred Bunnell and Dr. Patrick Moore have found that timber harvesting actually improves wildlife habitat and ecosystem diversity. If your tree is grown in Oregon, soil, air and water quality, and fish and wildlife resources will be protected during its harvest. To ensure that the roads that are built to provide access to your tree do not cause excessive erosion, there are strict rules in the Oregon Forest Practices Act. These rules are enforced by state forest practices officers to guarantee proper road location, design, construction and maintenance. Because these road standards have increased as more is learned over the years, many forest owners are voluntarily improving their existing roads to prevent erosion and protect streams. Your tree may be harvested to improve the health of its forest neighbors. Your tree might be dying from insect attacks or weakened from decay. Your tree may even be damaged and killed by wildfire or storm. By removing the weaker and overcrowded trees, the healthier trees will have more room to grow and be able to fight-off the pests or disease. A forest that is healthy, un-crowded and vigorous is unlikely to suffer severe losses from pest attack and fire or storm damage. Forest professionals have learned over the past century that managed, carefully tended forest ecosystems are much more resilient and resistant to losses than are overcrowded trees that are stressed from old age or drought. Cutting down one tree every year to meet your needs for paper and wood products might make you concerned that we will run out of trees someday. Actually, we have more wood growing in America today than we did 40 years ago, or even 90 years ago. How can that be, you might ask? Simply because forest professionals carefully assure that forest growth every year exceeds timber harvest -- by sustainably planting and intensively growing more wood than is logged. Since 1952, the total standing tree volume in US forests has increased 33%!! In 1991, the latest year data is available, the Pacific Coast region & Oregon wood growth exceeded removals by 14%. When your tree is cut it not only supplies the paper and wood products you need in a year, it provides jobs and salaries for people in the forest community and taxes to support local schools and essential government services. Although high technology employment now surpasses wood products industry jobs in Oregon, wood products still remains the leader in other significant economic measures, including "basic" employment (22%), "basic" income (26%), manufacturing income (25%), and harvest tax receipts ($304 million). If you live in a city or state where few trees grow, your tree this year will be gown and harvested in a rural forest--like those in Oregon. Oregon is the nation's largest producer of lumber and boasts one of the most productive forests in America. Most Americans do not grow their trees nearby, therefore relying upon other rural citizens to plant, grow and harvest their tree for them. These rural forest professionals have a grounded environmental ethic and pride in stewardship for the land. Since the early 1900's, a vast majority of our American population lives in cities -- far away from the farmers, miners, loggers and other rural professionals who feed, clothe and shelter this nation. This separation of consumer and producer has widened the disconnect between urban and rural America. Where will your next tree be grown and logged; and who will do the work for you?? Although your tree is growing in an American forest, escalating government regulations may prevent its harvest for your use. American forests grow far more trees than we consume, yet conflicting and misused environmental laws now hamstring a substantial amount of timber harvest on federal, state and privately owned forests. Luckily, another tree will replace yours if the government prohibits its harvest. Sadly, this replacement tree has been grown, logged and imported from another country for your use. Logging in third-world nations--where environmental protections are scant--is skyrocketing; in part due to escalating prohibitions from harvesting your tree. In 1996, 38% of all lumber consumed in the US was imported, and 5% of paper products Americans used were imported. For the many decades before your tree is harvested for your use, its accessibility helped forest professionals monitor and protect it from the ravages of pests, storms, stress and wildfires. During those years, recreationists enjoyed your tree and its surrounding forest flora & fauna -- when fishing, camping, hunting, hiking, biking and driving. If your tree is in an unmanaged forest lacking access, a nearby forest road must now be carefully built to reach it. The management and aesthetic enjoyment of your tree was made possible by the forest road which accessed the site where your tree was planted decades ago. Once again, the forest road will allow tree planters to return to plant another dozen seedlings when your tree is cut this year for your use. And the forest cycle begins again!